Street food culture in Japan is booming; nearly everywhere you go you can spot a food cart packed with customers young and old enjoying any number of their delicious, easy to eat treats. It’s not just in real life that you can see the popularity of street foods; they’re bound to pop up in almost any television show, game, or anime. One of the more popular and easily recognizable of these street foods is takoyaki (たこ焼き), grilled wheat batter shaped into balls, containing a fresh, chewy piece of octopus in the middle. These takoyaki balls are served warm, usually in a group of about eight, making them a great snack to share with friends. Takoyaki went through a few changes before it became the popular, delicious treat that can be seen anywhere in Japan today. 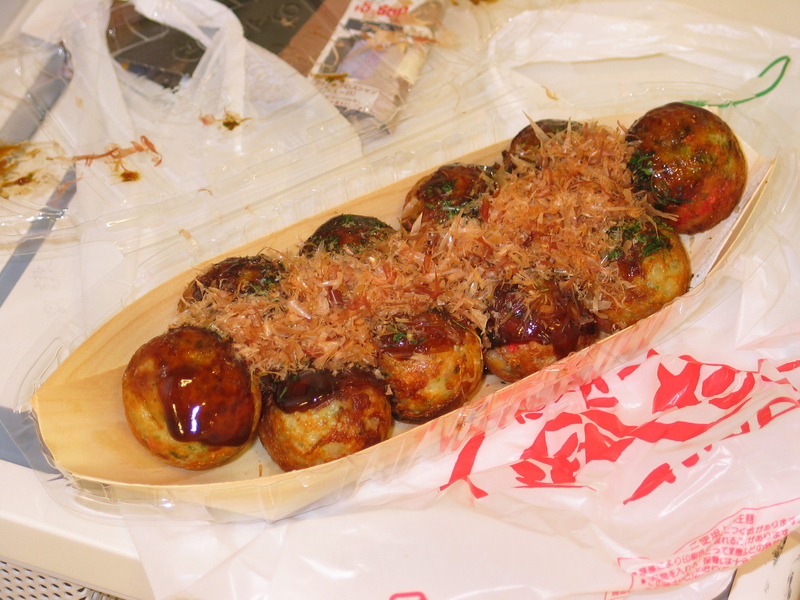 The first “prototype” of takoyaki is known as choboyaki (ちょぼ焼き). Choboyaki’s name came from the ‘drop by drop,’ or chobochobo (ちょぼちょぼ) method by which the flour-based batter was grilled on a flat, cast-iron griddle that looks a lot like the griddles used to make takoyaki today. The batter was made by dissolving flour into water and, after filling the semi-circle shaped divots in the griddle, dropping konnyaku, kizami shouga (red, pickled ginger), peas, and soy sauce in as the batter cooked. When taken off the griddle, choboyaki, with it’s square body and circular mounds, resembles a lego shape. From choboyaki came radioyaki (ラジオ焼き), which seems to have been named after the radio, which was, at the time, the most popular electronic invention. 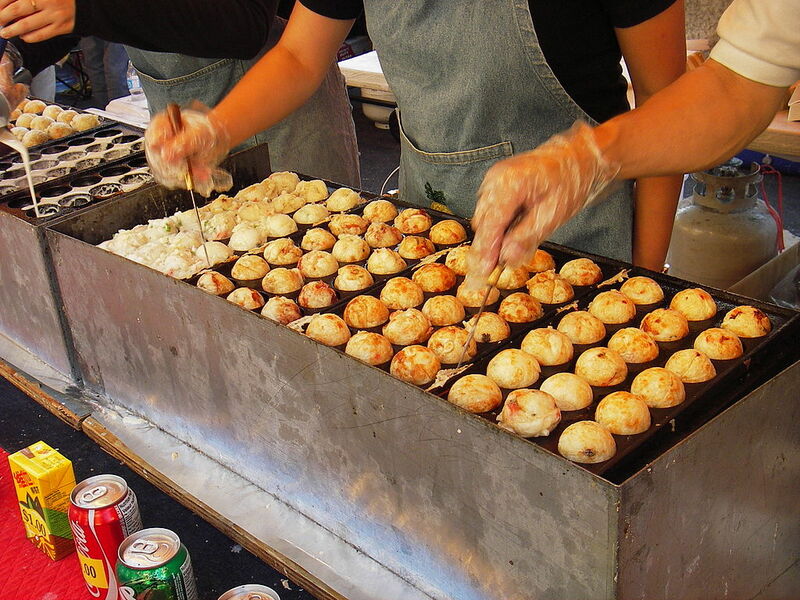 Radioyaki, though larger, is closer to takoyaki in shape: round balls of cooked batter. The evolution of choboyaki to radioyaki was more than just a change in shape; people began adding soy sauce marinated sujiniku (すじ肉), or sinewy meat to the mix. Finally, around 1935, radioyaki made the change to the takoyaki we know today. This is when the sinewy meat was replaced with small cuts of tako (たこ), or octopus. It’s said that the addition of octopus was because a visitor from Akashi, a seaside city in Japan, who was in Osaka passed a radioyaki stand and told them: “They use octopus in Akashi.” Whether this is completely true or not, the meeting of octopus and the seasoned batter was a popular one, which soon became more widespread and popular than either of it’s predecessors. Osaka lays claim to being the first to perfect takoyaki as it is today and, as such, there are many takoyaki restaurants and stalls all over the city; there’s even a takoyaki museum! 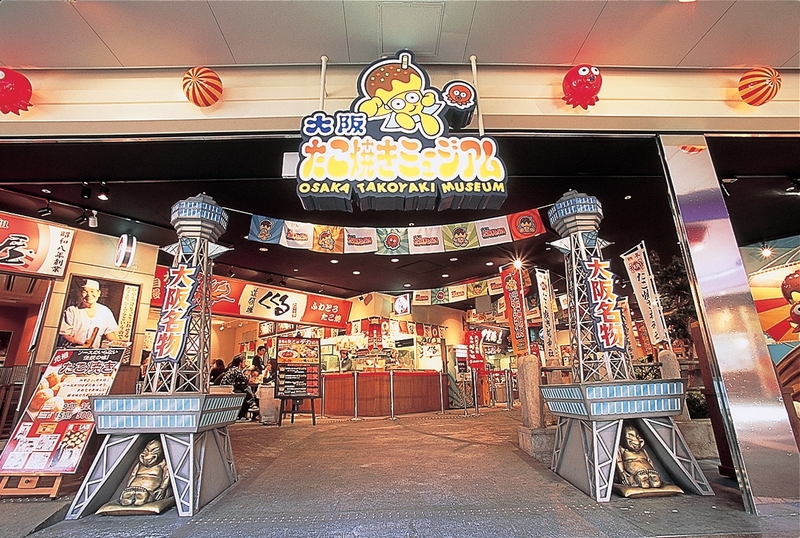 It may be a museum centered around one street food but they have information on everything used to make takoyaki, a theme park, games, toys, and they even gathered Osaka’s five best takoyaki restaurants to sell food inside the museum. Entry is free, so any takoyaki enthusiasts going to Japan should definitely check it out! With takoyaki pans and pre-made batter mix, it’s really simple to make your own takoyaki at home. 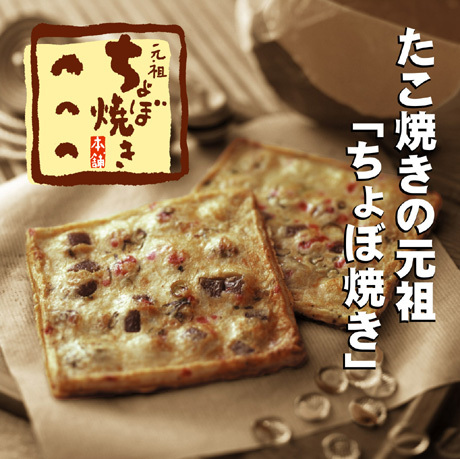 The batter tastes delicious cooked plain, but can be made even more delicious with the addition of kizami shouga, tenkasu (天かす) – little flakes of dried tempura batter, and chopped green onions. Just mix the batter mix with some water and pour it into the recesses of your takoyaki pan. Let the outside of the takoyaki cook a bit then add your piece of octopus to the center and turn the batter with a special ‘takoyaki pick’ or even a strong toothpick. Continue spinning the ball of batter every so often until the takoyaki forms a nice, round shape. Top your takoyaki off with takoyaki sauce, Japanese mayonnaise, bonito flakes, aonori seaweed flakes, and kizami shouga. At Asahi we sell everything that you need to make your own takoyaki at home, from the batter to the octopus to the pan to cook it in! Our staff can help you find everything you need in order to make delicious takoyaki at home. And there’s no need to stop at octopus, either; experiment! Is there anything else that you want to try adding into these delicious snacks? Are there any topics that you’d like to see us cover? Leave a comment below and let us know! Your topic could be the next one we cover! omg, i want to try my hand at this snack SO much! It’s killing me lol (^_^) it looks so good, i would love to try them & the family too . Takoyaki is a great food to share with friends and family and it’s a great snack food. If you’re able to get the materials to make them, it’s definitely worth trying! You can also try to find the frozen kind, they taste almost as good as fresh made takoyaki! Sometimes you can even luck out and find some at Japanese restaurants that have an “Izakaya” style menu.